For six decades pursued three passions – classical dance, activism and teaching- thereby influencing and inspiring untold numbers. 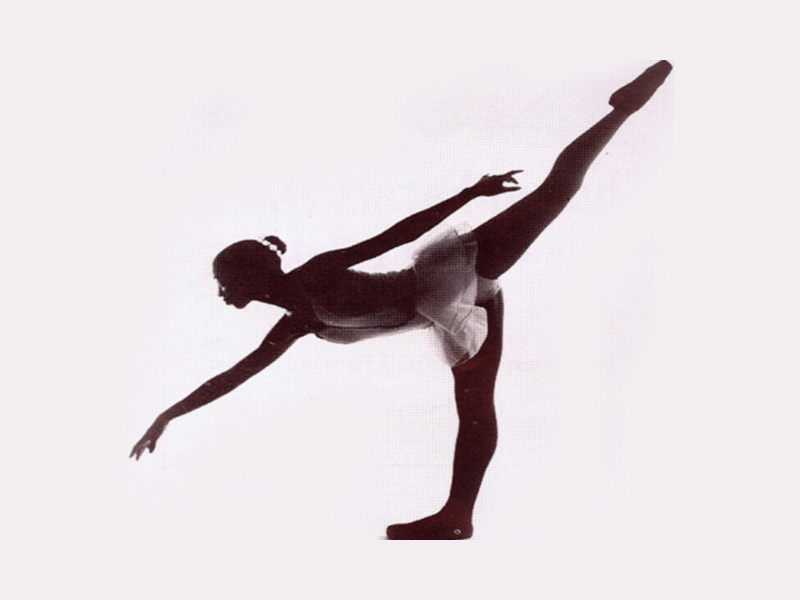 Bowen emerged as Lewis’s prima ballerina, and danced some of classical dances most coveted roles including Swan Lake at Boston’s John Hancock Auditorium. “Dance turned my world from gray to technicolor,” says Bowen. “She was a very exciting performer; ” says Lewis, “the audiences waited for her to appear. ” Lewis’s school grew from a living room in a rented house to a large studio. “When I saw that she could teach what she learned, I made her my assistant teacher,” says Lewis. When Angela was in her early twenties she wanted to pursue a professional dance career. Lewis urged her to remain at her school and continue teaching, and her mother wanted her to finish college. Angela assured her mother that one day she would finish college but that she had to dance while she was young. When Angela was only two years old, her father died and Mrs. Bowen was a young widow with seven children. She worked two jobs working as a domestic during the day and scrubbing hotel floors at night. “My mother told me that I had special gifts, but asked me what good are they unless you can share them. She also told me I had the right to live my own life.”, philosophies Angela has practiced all her life. Unfortunately Sarah Allen Bowen did not live to see the success of her daughter. Mrs. Bowen was 53 when she died. After mourning the loss of her mother, Angela left Boston and made her way to New York to begin her life. She was 22. She met up with Kenneth Scott her long time dance partner from the Lewis school who had already left Boston with the hope of performing in New York. Bowen and Scott confronted the unwritten policy of No Blacks on Broadway and repeatedly auditioned for ballet companies or Broadway shows knowing they would be dismissed. “We knew they weren’t going to take us, but we auditioned over and over again just to be in their faces. It was our job,” Bowen says. When Bowen found out about an opportunity to try out for a review touring Europe, she and Scott went to the audition and made the cut. “They wanted us to do all styles of dance, says Bowen.” They joined the Jazz Train tour, which offered them opportunities to travel and perform on stages in Europe including the La Scala Opera House, in Milan. Angela loved performing, but once the show was over, she felt very alone and unfulfilled. After nine months, she decided that the touring life was not the life for her. When she returned to Boston, she knew she wanted to open her own dance school. She married the young drummer, Ken Peters, whom she had met at Lewis’s studio. Bowen researched New Haven, Connecticut, a small city between Boston and New York, and she and her husband set out for the city with their 2-year-old son and $360 dollars in their pockets. The school held its first recital in 1963, and the community was awed by the quality of the dance and the music – both classical and contemporary. Shortly after their first recital, however, a drunk driver ran into their station wagon killing their three-year-old son. Bowen’s deep depression put everything into question. After several months, she pulled herself together because of a promise she had made to a very talented young man who had wanted to dance on Broadway. On that promise, the school re-opened and Bowen Peters went on to nurture the talents of children and parents in the community. Over the years, many of her students have opened up their own dance schools, or have gone on to teach dance themselves while others credit her for inspiring them to believe in themselves and for awakening their creativity. The school grew in size and reputation throughout the state and beyond. After nearly two decades of teaching,however, and a serious illness, Bowen knew that she had to change her life. She had discovered the writings of black and white feminists and determined that she had to find her way out of one life and into another – one that would allow her to discover her other talents and develop them. She continues to do this even now at the age of 76. At middle age, Bowen completed her Bachelor’s degree, keeping the promise she had made to her mother, and went on to become the first recipients of a Ph.D. in Women’s Studies and African American History at Clark University. Bowen recently retired from teaching at CSULB in the department of Women’s Studies where she taught for 13 years. Bowen is an Audre Lorde Scholar and has written and spoken nationally and internationally about the connections between and across social justice movements. She is currently working on a book of short stories. Angela Bowen has kept her passions alive across the decades, even in the face of poverty and the ugliness of racism, sexism, ageism and homophobia. She has nurtured and cultivated the next wave of young people assisting them to have faith in themselves, to discover their own talents, and to realize that each have something unique to share with the rest of the world. 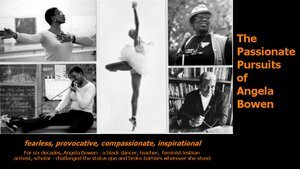 The Passionate Pursuits of Angela Bowen illuminates Bowen’s experiences through her richly layered lens as a black lesbian feminist artist, activist, mother, and teacher while tracing the major influences, challenges, disappointments, tragedies, accomplishments, and critical transitions in her life. The film is dedicated to the artists and educators who nourish our communities and to students who hunger to fulfill the passions inside them. Your donation of any amount will go directly to completing this film in 2012.